On my post the other day, I had a comment that I’ve been mulling since. The commenter asked why there were so many single mom/parent books out there these days. Point being, there are trends that seem to come and go, and influence what’s being produced creatively. Which leads me to my question: are there romance tropes out there that you feel like you’re seeing too much of right now? And, flip that around, what would you like to see more of? Hi Elizabeth! Interesting question. I think I have seen an increase in romances and Hallmark movies in the trope of false engagements or marriages of convince for an inheritance. Not sure what I want to see more of, because I also read different genres; so when I am “romanced out” – I read mysteries or historical novels or nonfiction. Looking forward to reading responses. Even with overused tropes, if the story has something unique – setting, unique occupation, mystery item, – something that sets the romance apart, then I do not mind an over used trope. Enjoy fall & the weekend. Best wishes. And yes! I love seeing all the different takes that are possible on the same trope — there’s so much variety available. You are right, movies do seem to copy each other or go in spells of same theme. It bugs me! But I can see where people would jump on board if a certain trope is doing good. Renate had a good one with the explosion of false engagements, it seems. For me, I switch around my reading quite a bit so I don’t get too many of the same story at a time. I think the billionaire trope is popular right now. At least I’ve seen a lot of titles reflecting that. I read one recently and double checked the title, it was an interesting book but the only place billionaire was mentioned was in the title. Billionaire is definitely popular right now! And I laughed at enemies to lovers. It’s one of my favorite too. Probably also because of P&P. I enjoy them all, I guess! I read a book the other day that made me realize that I want to read more romances that are more about their life circumstances and they fall in love and support each other through it all, with no fall out or fight or misunderstanding where they break up and then get back together. I’ve been getting annoyed with all the pretty girls and handsome hunks that just seem to fall all over each other. Just give me an average girl and an average guy where the attraction is more than skin deep. I love average guy/girl books too — I do feel like the InspyRomance Authors do a great job with those sorts. I’d like to see more single mom stories (I think because I was raised by one 😊 – and this must be why I like Love Inspired so much), rich and poor, and friends becoming more tropes. For me I’ve seen to many girl meets prince. Thank you for sharing. I’ve read more books with reality TV shows as backgrounds recently. I guess this trend is hot since reality TV shows are growing. It was a trend a few years ago, too. I kind of like seeing it come back. 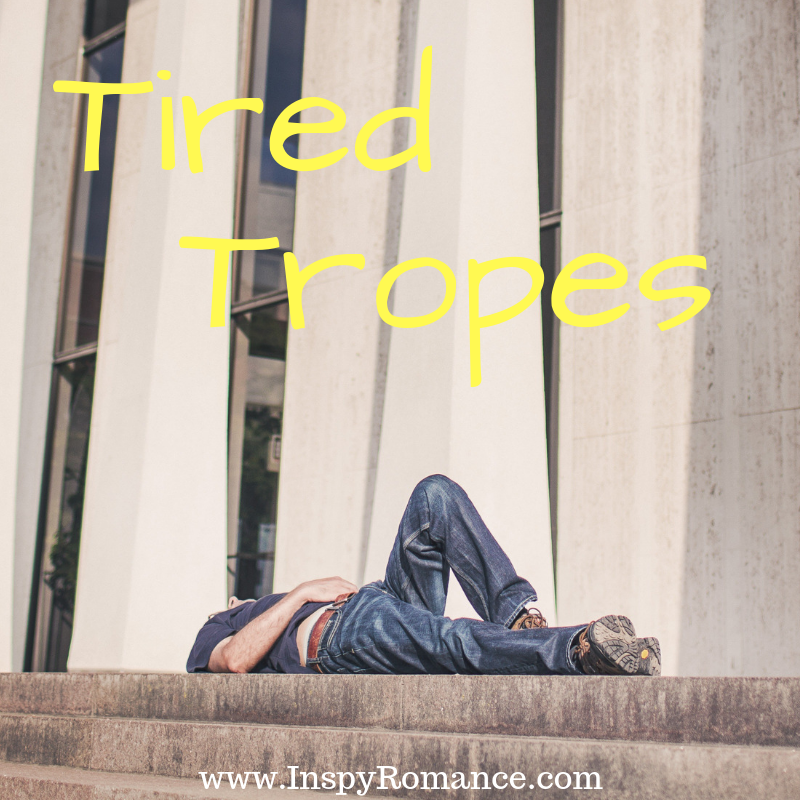 I had never heard of tropes until earlier this year and I had to look it up. I’d been writing them for years without knowing what they were. I love friends to romance and pretend relationships that grow into the real thing. The pretend relationship can be a lot of fun. I’m not sure if that answered your question, but I’ve definitely noticed it a lot lately in all of my review books. Oh wow. That’s kind of good to hear because I have been feeling like myabe my books are too light these days. I’m not fed up with any of them, but I am fed up with those muscled guys on covers. Makes me role my eyes. That’s a hard one, because authors either have very little say in what their publishers choose or they’re limited to the types of models who are available in stock photography. Even expensive stock photography has its limitations. Some folks do their own cover shoots, but that’s not a guarantee for something looking professional (I’ve seen some custom photo shoots that would’ve been better off with stock images) or an absence of a hunky guy. I really wish there was a way to explain to readers the difficulties of covers and beg for a little extra grace all around. I totally agree with girl meets prince, billionaire stories, and single parents are tropes that just happen to be a fad here and there, but they get old pretty soon. I guess you need something to lead the way for the relationship, and it might be hard to come up with new plots (maybe?! maybe not, because some of you here at InspyRomance are just good at it). Renate had a good point that unique stories are worth reading despite what’s behind it (one of my favorite stories Nowhere for Christmas has a single mom and the kid is just precious, definitely a story that would not be great without him). Others just seem to hide behind the fact and get tedious pretty soon: oh, I’m a prince, I can’t possibly; oh, I have to put my kid first; or is she after my money or me as a person? This is probably a late comment because I don’t get time to check it out everyday anymore, but I felt like commenting, since I’m somewhat responsible for this. The only overdone ideas I can think of right now aren’t something I see from authors here, and I’m not sure they’d be classed as tropes anyway. I’m someone who will switch genres every once in a while to take a break, or stop reading entirely if I can’t find anything to read that isn’t the same old, same old. That doesn’t happen very often though, because as long as the story is unique, even if the basic idea is the same, it’s still going to be different. I just wanted to add…I too would like to see more sweet romances without the angst and deep issues that so many books seem to delve into. Sometimes, when life has been rough/tiring/overwhelming, I just want to sit down and read something sweet and uplifting. Deep themes are fine and I do enjoy those kinds of books, but when life has been rough, those kinds of books are a bit too overwhelming.